AN AFRICAN ' PHOTO FINISH ' ! The photograph which made the world to stare! Once again Christmas season has come to our life .This time while at Kochi where it is celebrated with much enthusiasm, could be one of the best in India. Our visit to witness this particular carol service was not accidental. There were two attractions. We had missed this annual service staged by local YMCA/YWCA and a dozen churches of different christian factions - such unity is rare-for more than three decades plus two of my personal friends who are as old as me - Nebu and Renji- were participants of this event for long. Kevin hailed from Johannesburg, South Africa. After few errand jobs initially, he started to work as a photographer in 1983. Photography seemed to be his passion and soon he started to show his professionalism.He has to his credit a lot of photos about brutality of the apartheid prevailing in South Africa which he has exposed to the outside world in spite he had an English origin. To cover the terrible famine in South Sudan in 1993 , he went there. 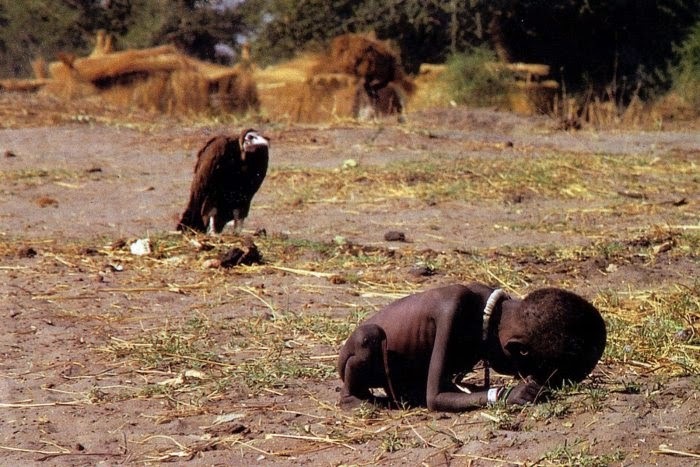 He noticed this skinny, poor child who was struggling to reach a feeding centre of United Nations. Her parents it seems were away at the feeding centre to collect the food being distributed. It was then a vulture came from nowhere and started staring at the girl.... for the right moment to strike on the prey. Kevin waited for few minutes, then clicked few snaps.He promptly chased away the vulture. The snap which was clicked made the world to stare in disbelief! However a number of viewers contacted the newspaper office to know the fate of the girl who was featured in the photo. The paper reported that it was unknown to them whether she had manged to reach safe. Kevin was unable to answer convincingly the question raised although he claimed later to have picked her up and carried her to the nearby feeding centre. His fame went up with his career soon after but not without problems.He seemed to have stepped up in his drug habit as well. While he was working for Reuters in May 1994 he was awarded with Pulitzer prize for feature photography. His instant fame had no boundaries.Where ever he went while in New York people wanted his autograph. Photo editors at the major newspapers and magazines wanted to hire this new found professional. He signed a contract with Sygme, one of the most known photographic agency and returned to South Africa. He invited a lot more criticism as well along with Pulitzer. Experienced professionals can understand that it comes along with fame from those who are jealous, at times even from some of the unexpected quarters. But Kevin was too young to face. Many questioned his ethics in wasting time to take pictures than helping the girl. Few even went to the extent that the scene was 'staged' by him. "Not one but there were two vultures present- one in the photograph and the other behind the lens" wrote St Petersberg(Florida)Times.Seems it was beyond his comprehension.He became depressed!! He chose a self inflicted cruel method to end his life barely two months after he got the Pulitzer! He drove his pick up to a spot where he used to go many times as a youngster. One end of a hose was taped to the exhaust pipe of his vehicle and the other end to the drivers side window. He put music in his Walkman and started the engine! He died of carbon monoxide poisoning !! It was on 27 July 1994 and he was only 32!! Kevin wrote in a note"I am really sorry. The pain of life overrides the joy to the point that joy does not exist". I am sure that all my readers will agree with me to the point that Kevin did something he should not have.Come what may,he should have kept his cool and waited.There is always room for corrections in one's life.Pain and joy are two faces of the same life which comes in cycles which everyone has to go through without exceptions.Only the degree varies!